You no longer have to depend on the mail to get your premium payment in on time. You no longer have to pay interest or a fee for the convenience of using your credit card over the phone. No more additional expense for overnight delivery. We now can accept your check off of the Fax Machine! Prepare your check in the normal fashion, as if you were going to hand us your payment or mail it, using today’s date. Write in the amount you agreed to pay and make your check payable to Offshore Risk Management. When you have completed your cheque sign it. Simply tape the completed and signed check on a piece of plain paper or photo copy the correctly made out check. 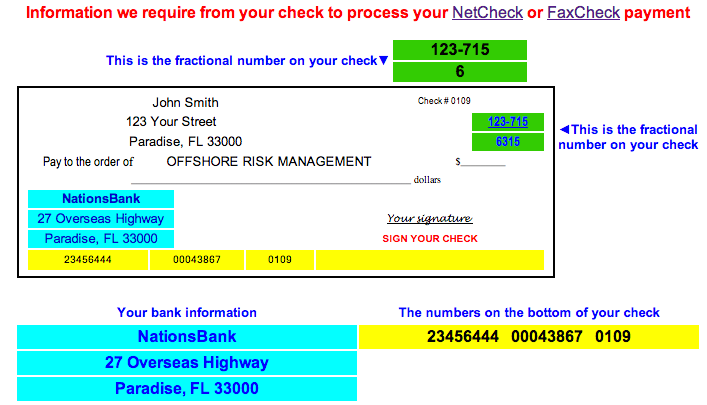 Adjacent to the check, please print the small fractional bank number (usually located in the upper right hand corner of the check), the name and address of the bank, and the row of numbers printed at the bottom of the check. This small print usually does not fax through clearly enough to read. Your check must be signed for us to accept it. Feed the paper into your fax machine and send it to us. You keep your original check and we will mail you a copy of the check/draft issued here for your records. No fees. No extra cost. Great for making payments from spots around the world where the mail can take over three weeks to arrive at its destination. IMPORTANT: Please note no coverage is bound or in force until confirmed in writing by our office. By sending us the requested information, you agree with these terms and authorize us to debit your bank account according to the information provided. If your item or items is/are dishonoured all coverage/service is void from the date of inception.